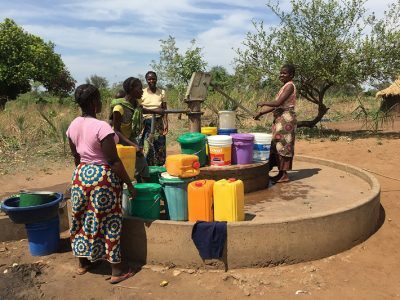 Making water available near to home frees up women to undertake income earning activities, providing money for households that can be spent on healthcare and children’s education. Several key issues underpin CRIDF’s decisions to focus on the Southern Africa region. The poor in Southern Africa are badly affected by climate change. Southern Africa has a highly variable climate where extreme flooding is often punctuated by long droughts. This makes living conditions very difficult for the poor. Floods, for instance, can destroy a farmer’s livelihood overnight, and droughts drive people from their homes in search of water. Climate change will only worsen these problems, threatening more and more people’s lives and livelihoods. Southern Africa is a vast area with a complex socio-political landscape and geography. Over 70% of the Southern Africa Development Community (SADC) region’s freshwater resources are shared between two or more member states. Southern Africa has a vast array of social, environmental, economic and political perspectives. And, as in every region, its water resources have to serve a variety of different needs – ranging from providing drinking water, to servicing agribusinesses and industry and thus driving economic growth. It is increasingly recognised that collaboration to manage transboundary resources is key to building climate resilience, promoting sustainable development and tackling issues of peace, sovereignty and security. Land masses are not flat. 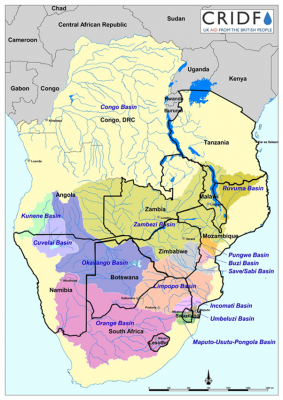 Within different regions the land is divided into adjoining depressions known as ‘river basins’ – there are 15 in SADC, which CRIDF works in. Within these depressions, all the water above and below ground flows downwards to central rivers and then out to estuaries and into the sea. Critically, the borders that make up countries do not follow the margins of these basins. This means that a country may straddle more than one basin, and any changes made to water flows upstream by one country (such as building a dam) will influence water availability for those living in other areas or countries further downstream. As a result, water management in basins and across borders has to be carefully planned in order to avoid future conflicts and to avoid the poor being marginalised.